Are you pregnant? OMG, when are you due? Sorry lady, this, this right here is all bloat…..a mix of gas, food, and crap. Sorry to disappoint….I’m still not pregnant. I know the feeling all too well…and I’m sure many can relate. Whether or not you are trying, the endo belly is the real deal. 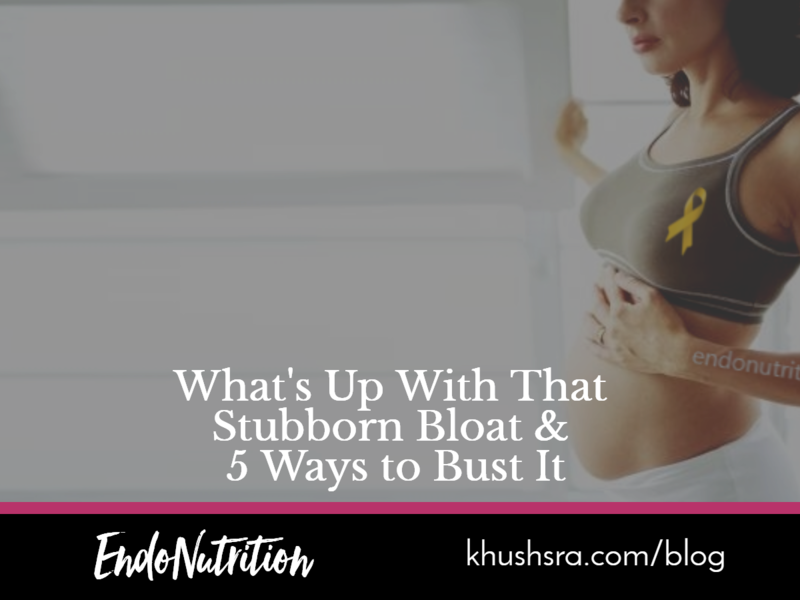 It’s not your soft pudgy muffin top kind of belly, this is true bloat. The endo-belly feels tight, and it’s big and round like a basketball pumped full of air. There’s a discomfort that hurts and makes going to the washroom feel impossible. So what’s going on? I honestly thought it was just an upset stomach and that I was constipated. I thought fibre would help. This lasted for years. But after geeking out on the science and making myself the guinea pig; here’s what I have discovered. Our gut is home to the largest part of our immune system. Our stressful lives, toxins in the environment, antibiotics, the pill, processed foods and more can wreak havoc in the gut. Women with endometriosis are known to have a higher level of toxins in their blood and this could very well be why we experience gut related issues. The gut responds to these problems with inflammation (think of the body sending blood to swell up and heal the inflicted area). When there is inflammation in the gut our digestion weakens, nutrient absorption goes down, and the gut becomes more permeable for pathogens and proteins to ‘pass’ through the gut lining. The increased permeability (leaky gut) enables proteins like gluten and casein (from dairy) to pass into our bloodstream and trigger the immune system to attack them (because they don’t belong). This is called an autoimmune response, which has been linked to endometriosis. And then you have poorly digested food, inside an inflamed gut, with proteins getting attacked and everything kind of gets stuck. But what can you do? Is there anything to help? Yep! 5 ways to support your gut and beat that endo-belly. The mouths job is to break food down and mix in the saliva enzymes to help digest the food when it’s in the stomach. Our stomach cannot break food down mechanically, so if it didn’t get a head start….you are relying on enzymes and stomach function to digest the food. Not a good idea. Our stomach takes between 30 minutes (fruit) to 4 hours (protein) to empty. As long as there is food in the stomach, the juices (enzymes) are in use and there is no reserve built up. Too often we are continuously snacking and eating food without asking ourselves if we are really hungry. When the stomach gurgles, it has juices and is ready for more food. Next time ask if your stomach is ready or is just it my mouth…two very different scenarios. Believe it or not, your stomach needs acid, lots of it, to digest food. Often when we have taken painkillers for extended periods, one can experience heartburn or GERD. It’s then common to use antacids which reduce the acid in the stomach and further reduce our stomach’s ability to digest food. Using a digestive enzyme or HCL (Hydrochloric Acid) supplements can aid in increasing the juices needed. HCL should not be used if you have an ulcer or burning sensation in your gut. Broth is high in collagen, zinc, vitamin A and vitamin C – all of the nutrients needed to help heal the gut lining and reduce inflammation. Drinking broth gives our digestive system a break while nourishing it with vitamins and minerals to help restore itself. I’ve shared a recipe below for broth – both chicken and vegetarian! Constipation is a common problem when there is endo-belly and only amplifies the problem. Keeping the bowels moving requires you to be consistent and smart with your water intake. Drink enough – a minimum of 2L, but always drink away from meals, and avoid chugging your water. Drinking water close to food can dilute the digestive juices and slow things down. If water alone is not keeping you going regularly, try a magnesium supplement at bedtime (citrate form is good for the bowels). Before you go, there is one more thing, if I didn’t mention it would be a disservice to you, and that is castor oil. The above tips have to do with food, but castor oil is an oil that’s topically applied and supports digestion and elimination. Stay tuned for my next blog where I share more about this gem of an oil. Place the bones (or potatoes) in the slow cooker. Add all remaining ingredients. Set slow cooker to low and let cook for at least 12 hours. Let’s stay in touch….enter your contact information and I’ll send you information on living an anti-endo lifestyle, without bogging down your inbox. By entering your information you consent to be on our mailing list.